BPE's mission is to drive exceptional outcomes for all students by developing great teachers and great schools. BPE is an education organization operating a PreK-12 pathway of neighborhood based Teaching Academies and a city-wide network of teacher support. Through our Teaching Academies and our nationally recognized and replicated teacher training program, we drive exceptional outcomes for Boston’s students. 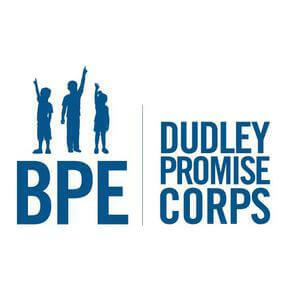 Dudley Promise Corps (DPC) empowers recent college graduates and community members to serve in a BPE Teaching Academy for a year, playing a key role in the school community. DPC members provides students with the extra academic and social emotional support needed to ensure they are on track for college and career success, while simultaneously developing corps members as engaged civic leaders committed to social justice. -In 2009, the federal Teacher Quality Partnership grant program was developed to replicate our residency model nationally. Dudley Street School. When we opened the school in 2012, just 29% of students were reading on grade level. At the end of the 2015-16 school year, 68% of students were reading on grade level, and 76% of students met or exceeded growth targets for reading.